How come I can never find a hummingbirds nest? Do they nest like regular birds? 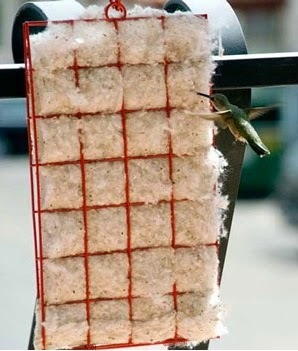 Hummingbirds' nest are so well camouflaged and so very, very tiny most people will never discover their location. 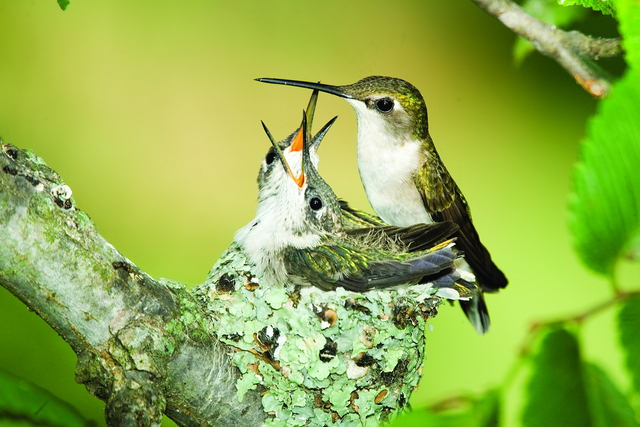 Ruby-throated Hummingbirds only nest one time a year. The female alone constructs a cup shaped nest with a diameter about the same size as a quarter. She starts to build with bud scales and spiderwebs and then camouflage the outside with lichen. To cushion the inside of the nest they use cotton nesting material, or some other plant fluff like dandelions. Courtship is very brief and then two white, pea-sized eggs are laid two or three days apart, which the female will incubate from 60 to 80 percent of the day for 10-14 days. After the babies hatch, the spider web nest stretches to contain the growing nestlings. When they leave the nest, 18-22 days later, the chicks are twice as large as their mother which was stressed by raising them. If a Ruby-throat nests near your feeder she may appreciate quick bites to eat while incubating eggs. When the chicks hatch, they need a lot of protein, so their mother spends a lot time foraging for small insects and spiders. Throwing old banana peels in the garden as compost will attract fruit flies for the hummingbirds and fertilize your garden. After the chicks leave the nest, mommas will bring these newly fledged hummers to feeders and you can watch them check out everything to see if it is food. It usually takes them awhile to figure out what’s food so fledglings are fed by their mother for another 10 days. 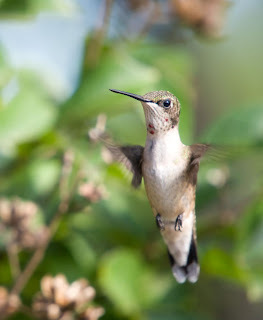 Young hummingbirds will look similar to a female, but as young males begin to mature in late summer look for a few random red iridescent feathers on the throat. And the young are very healthy looking. Their feathers are full and shiny whereas the parent birds look a little haggard. If you keep your feeders filled and fresh you should have hummers visiting from April until usually the end of October.